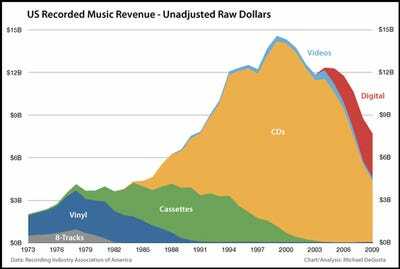 The chart says “Bain Analysis” but it’s very unclear that they did any analysis, since anyone paying the RIAA $25 can login and immediately see virtually the same chart, albeit formatted slightly differently. 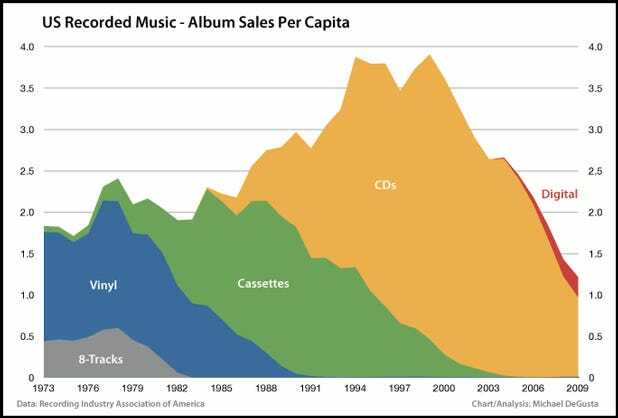 They fail to clarify how & if they distribute the RIAA’s 16 sometimes vague categories amongst the 4 they use. 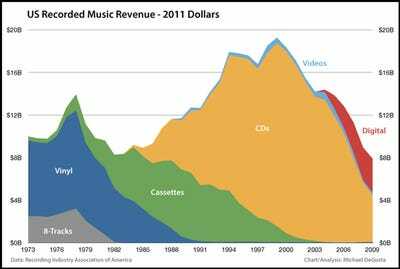 All discussion herein is for US recorded music as covered by the RIAA. 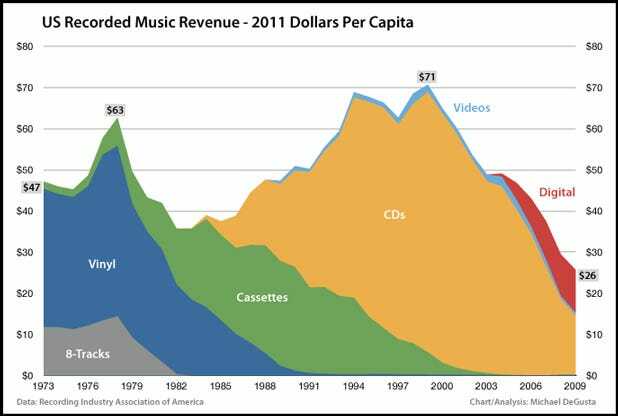 The above chart is adjusted for inflation & population – for full details, see below. 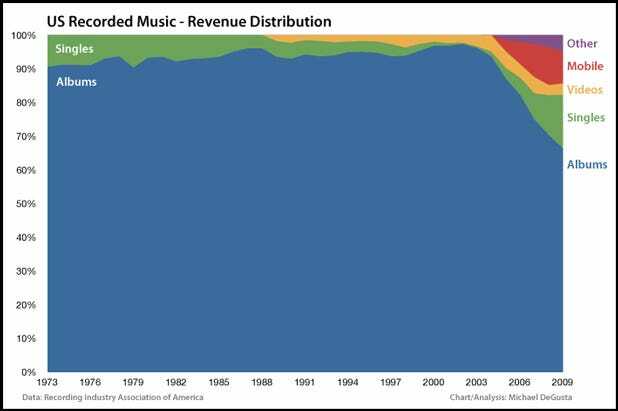 That’s just over 1 album per person per year now, and only 0.25 downloaded albums per year. 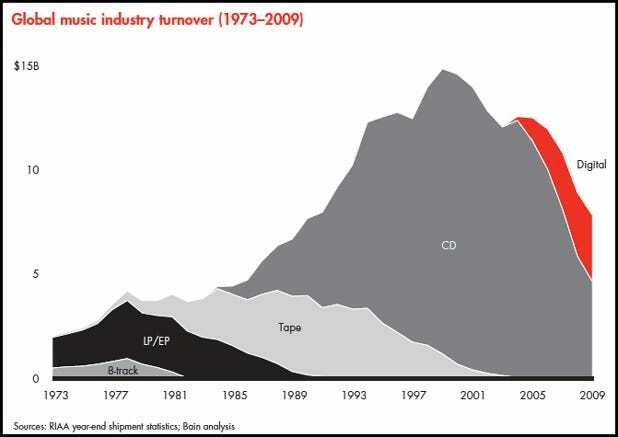 Here Mr. Gruber’s guess is more on target, though current numbers are still substantially below pre-CD numbers. 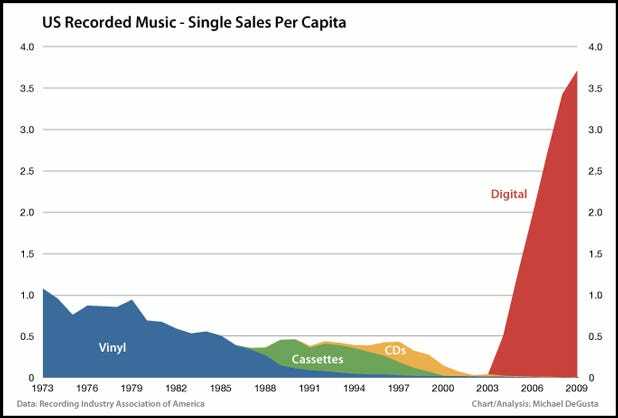 In addition to piracy and the general lack of interest in buying albums vs singles (see below), it’s also possible that consumers’ ability to convert CD to digital versus having to rebuy vinyl albums on CD accounts for some of the disparity as well. Downloaded albums & singles have grown nicely, but we’ve already established that is not nearly enough to offset the loss of the physical equivalents. Mobile, which includes “Master Ringtunes, Ringbacks, Music Videos, Full Length Downloads, and Other Mobile”, hit its peak in 2007 and has actually been in decline the past 2 years. 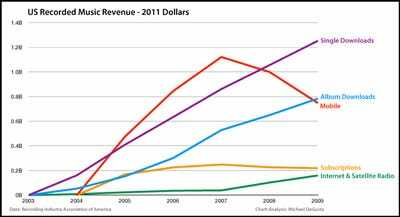 Looks like the death of the ringtone – and possibly the birth of the iPhone? Subscriptions – presumably Rhapsody, Zune Pass, and the like — have also drifted downward the past 2 years. That only leaves internet & satellite radio – Pandora, etc — and others that pay via SoundExchange. 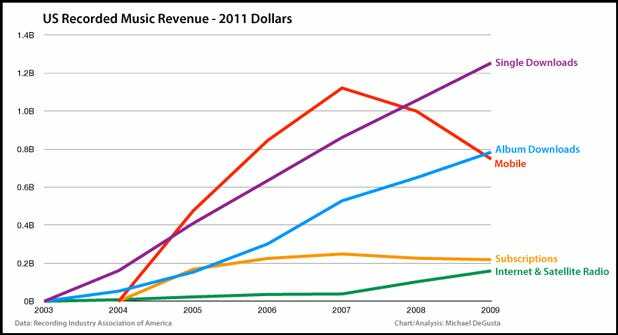 It had a good uptick since 2007, but that’s when they negotiated royalty rates for online broadcasters. Even if they maintain some solid growth, it still adds up to a pittance.